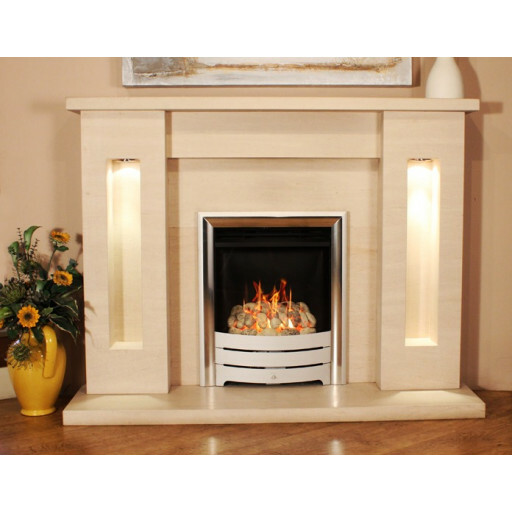 The Chapelo Limestone fireplace with recessed lights on each side is made of solid limestone. With a mantle spanning 1380mm (54”) and standing tall at a full height of 1050mm (41”), the Chapelo fireplace would make a marvellous addition to any home’s living area, providing warmth and comfort to your family for many years. The inside dimensions of the fireplace, 730mm x 810mm, make it the perfect size and area for accommodating a warm, cosy fire. When professionally installed in your home, it will add a beautiful finishing touch to your living room. The Chapelo is available with the option of easy financing for qualified buyers and includes free mainland delivery in the UK. The Chapelo also includes a 1-year warranty. I liked the unusual design of this fireplace with the light up legs. I looks lovely in the evening with an ambient glow. Looks lovely and I can display my two Lladro figurines inside both the legs.